Olympia is extremely quiet today. It is the end of the tourist season. The cats that wander from one restaurant to the next meowing for handouts will have to find a new con when they close next week for the season. All of the archeological and cultural sites in Greece – possibly in the entire EU – are free this weekend. Even so, Olympia, out of the way as it is, isn’t crowded. At the Archeological Museum the occasional tour bus crowd sweeps by us, then recedes like an ocean wave, leaving us alone with the treasures from Ancient Olympia, the site of the first “Olympic” games in 776 BC. Most of the ancient city was devoted to the Greek athletes; baths, training facilities, and a stadium. The Temple of Zeus and the Temple of Hera hadn’t been built back then. In fact, the Greeks didn’t invent their pantheon of gods until hundreds of years after the first Olympic games. When the gods arrived in Olympia, they did so in a big way. Their isn’t much left of the Temple of Zeus in the ruins but the friezes from the pediment are pretty well preserved in the museum. One pediment shows the classic story of the Greeks battle with the centaurs with Apollo taking center stage. The other depicts the chariot race between Pelops and Oinomaos, another classic tale. The interior metope sculptures show the Twelve Labors of Heracles. They are a bit worn but still interesting. We waited until late in the day to visit the actual site, one of the advantages of staying in town. The last of the tour groups was leaving as we arrived and the late afternoon sun gave everything a honey glow. 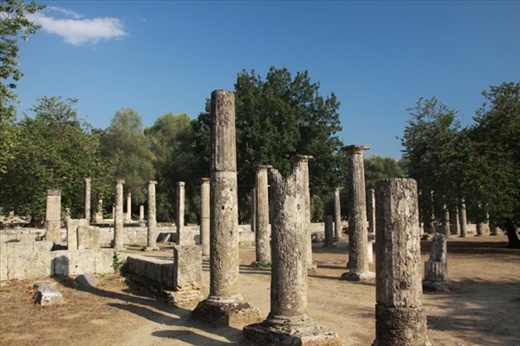 Little of the city remains intact but with the place to ourselves, it was easy to see Olympia as it must have been in the 5th Century BC.